To all the dudes who are upset about the new rules for prize money, it’s time to get over it. 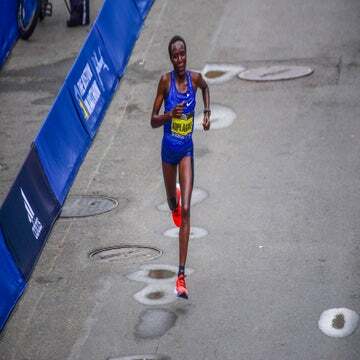 Since 2004, about 50–60 female runners each year at the Boston Marathon have been eligible to win the women’s prize money, while approximately 7,500 or more male athletes have competed annually for the men’s cash awards. Seems a little off, doesn’t it? Well, the rules are changing in 2019, which Women’s Running reported more than a month ago, with little fanfare. It wasn’t until a couple weeks later, when this year’s participants began receiving their bib numbers and starting position assignments, that the chatter really started. And by “chatter” I mean complaining. What changed? It’s the first time that the men’s elite field will start the race two minutes earlier than the first open wave of runners. The athletes in the earlier start will be the only ones eligible to win a piece of the $706,000 prize purse, to fall in line with the women’s award eligibility policies that have been in place since the professional women’s early start, now 30 minutes ahead of wave one, was implemented 15 years ago. Traditionally the pro men started at the front of that first group of open, mixed-gender participants, which meant that any of the age group men also in wave one could unexpectedly pick off a race favorite to land in the top 15 finishers, earning anywhere from $1,500 to $150,000. The women in wave one, however, weren’t afforded the same opportunity, having started 28 minutes behind the pro female athletes. 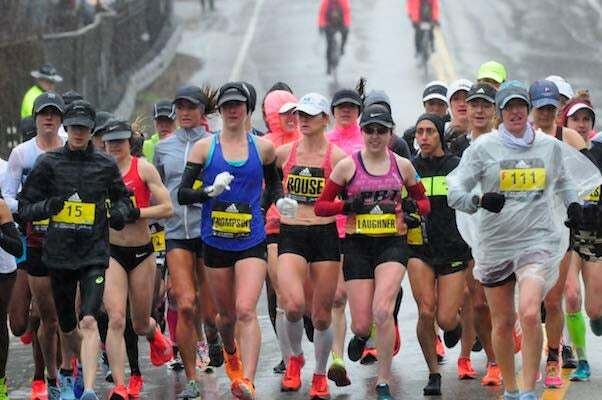 The issue was brought to the forefront after the 2018 race, when the torrential downpours, wind, and cold temperatures played heavily into the racing tactics of the elite women’s race. 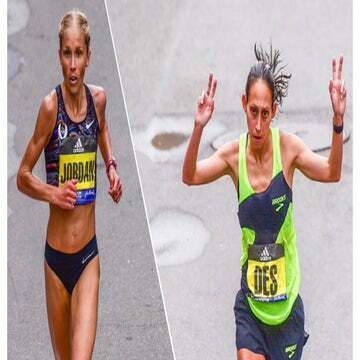 Desiree Linden became the first American woman to win Boston in 33 years, but many of her competitors faltered in the conditions. Meanwhile, three women who started in the mixed-gender wave one clocked faster “chip times” than the top 15 in the elite race, though they were ineligible for the prize money, because they weren’t actually competing in the same field (the BAA eventually paid the non-elite women equal prize money after much media attention). This year, the BAA has granted anybody who has achieved the 2020 U.S. Olympic Marathon Trials standard, which is 2:19 for men and 2:45 for women, entry to the earlier professional starts, to allow more of them to compete up front. Approximately 70 runners will be included in each race. But cue the disappointment from men who have fallen short of that standard—and the outcry from the (mostly male) observers who recall the glory days of the underdogs and unknowns who felt like they had a shot at running stardom. Welcome to 2019 and another step toward gender equity. Where was the concern 15 years ago, when women were divided into elite and wave-one categories? Weren’t any men outraged at the disparity between who was considered “elite” and “sub-elite” then? No? Shocking. I was among the first to say last year that the women who started in wave one shouldn’t have received paychecks. The fact was, they didn’t run the same race as the athletes who started 28 minutes ahead of them. Them’s the rules, you know? However, a valid point was made as a result—that the men of comparable ability had a legal chance to crack the top 15 and run for the money, and the women did not. Something had to change. It’s been suggested that the answer isn’t to divide the men the same way as the women, but to put the elite women back in the mixed-gender open wave or soften the qualifier to add more women to the elite category. This year, the BAA has increased the number of women in the elite start by inviting those who have the 2:45 qualifying time to join it, then applied the same standard (2:19) to the men’s elite field. But I can’t support an option that sends pro women back to racing at the same time as everybody else. First of all, it takes away their ability to truly compete against each other when they’re blending in with a lot of men who are running the same pace or interfering with tactics. It also significantly diminishes the amount of exposure the women have on television, in photos, and to the fans lining the course. That kind of spotlight is critical for the earning potential of female athletes, whether in the form of sponsorships or subsequent appearance fees—and an opportunity they get maybe once or twice each year. Women receive only about 4 percent of all sports media coverage in the U.S., according to the Tucker Center for Research on Girls & Women in Sport at the University of Minnesota. Nobody should be in favor of taking away one of those precious few opportunities. Boston is all about qualifying. What makes this race magical is that it requires all of us as runners to raise our standards. Many of us train for years to earn a spot—any spot!—on the starting line. When we finally do, we aim higher—a better seed, the next corral, a faster wave. This race, its history, its allure, is one-of-a-kind. We have to earn our experiences there—and every time the BAA has raised the bar, all kinds of marathoners have met the challenge. For the handful of sub-elite men and women who are on the cusp of achieving Olympic Trials standard, and therefore don’t have an invitation to the elite start this year, maybe it’s disappointing. It’s also hard for the runner who missed the registration cutoff by a couple of seconds, or the fastest guy in wave two. It is up to the organization to decide where to draw the line and somebody is always going to be on the other side of it. We all have to choose which races offer the best opportunity to achieve individual goals. If Boston’s rules hinder your objectives, there are plenty of other options out there. Go get that standard somewhere else and relish your achievement at the Boston Marathon in 2020 or 2021. Not everybody should be eligible for prize money. The days of the “underdog story” in our sport are numbered, or maybe they’re done. Runners aren’t invited to compete in elite marathon fields solely based on their performances and results. It’s well known that officials are doing more research into the training environments, coaches, agents, and medical professionals with whom athletes associate and, based on that information, are trying to assemble the fairest fields of play they can. Many of these top runners are in drug-testing pools that offer a better chance of catching cheats. Just this week, the World Marathon Majors, which includes Boston, announced a partnership with the Athletics Integrity Unit, to use intelligence in anti-doping efforts. “What we need is an elite level testing program that has to be intelligence focused, which means it has to be individually tailored, testing the right athletes at the right time to catch them in the act,” said Brett Clothier, the head of the AIU, according to Sports Illustrated. An underdog victory these days often raises eyebrows and suspicion, which ultimately seems worse for the sport than giving qualified men a two-minute head start in Hopkinton. In the end, we’re talking about 120 seconds and a new rule that, in reality, impacts possibly five or 10 men. But I applaud the BAA for recognizing a gender equality problem and trying to do something about it. Maybe we’ll discover that this change isn’t the right answer—but it’s reassuring to know that the people behind the world’s oldest annual marathon are willing to revise its policies to better reflect the present day. If only everybody could so gracefully let go of the way things used to be.